The Kurma Purana was originally recited by Vishnu who was in his Kurma avtar. This is why it was named the Kurma Purana even though it was a tamsik Purana. Later, it was also recited by Lomaharshana to some sages in the Naimisharanya forest. Let me start the review now. 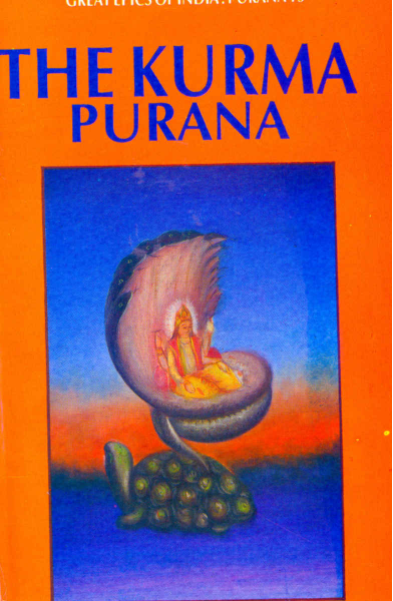 This Purana had many stories most of them were the same as those in the other Puranas but few were different. Of these different stories two were unique and unheard of. I will narrate them below. Have you ever heard of the Sita that was an illusion? Well it is real according to the Kurma Purana. We all know that Ravana came to the hermitage in disguise to abduct Sita. Sita realized this and foiled his plans. She prayed to Agni who appeared. He then absorbed Sita into the fire and left an illusionary one in her place. Ravana abducted the mayavi (illusionary) Sita and a huge war was fought over her. After Ravana was defeated Sita had an agni pariksha. When this happened the fake Sita went into the fire and the real one came out. This way Sita was always pure and clean. It was so shocking to realize that a huge war had been fought over a person who was not even real. I had never heard this story before and it was really surprising and interesting. The second story that I would like to share is about how Ganga descended from the heavens. This is a different story from the normal narrations. Vamana was one of Vishnu’s avtars. He had gone to Vali, the asura king and asked for three steps of land. Vali granted this. Vamana then grew to a giant size and covered the earth in his first step, the sky in his second step and the heavens in his last step (most stories have a little difference that his third step was on Vali’s head). The world was in a golden egg that was floating on water. When Vamana took his steps, a crack appeared in the egg. A little water entered the egg and began to flow from the sky. This became the river Ganga. I found this a very different narration as most stories say that the sage Bhagiratha prayed and got Ganga down. I liked it as it was very interesting too. It was also unique because it mentioned that the world was in a golden egg which was not said in the other Puranas. Few precautions are that this Purana should not be read or recited in front of a shudra and non-believers in the Vedas. Anyone woh does not follow this is born as a dog in the next life. The Kurma Purana is also very sacred as anyone who reads it attains Brahmaloka. A person who reads only one chapter is forgiven of all sins. One who donates it to a brahmana attains undying punya. I loved reading this Purana and recommend people to read it too. This review was first published on OpIndia on 4th March, 2018.